Clonie Gowen was born Cycalona Gowen in a raging storm during 1971. She has not slowed down since. At the poker table, she is a force to be reckoned with, yet she is a gracious winner. Her formative years prepared her well for competitive situations. She grew up in Kiowa, Oklahoma, winning the title of Miss Teen McAlister, Oklahoma in her fifteenth year. Her teen years were spent in Corsica, Texas. In high school, she was intensely involved in sports. She was a powerhouse on her varsity basketball team. She also participated strongly in such events as the high jump as far as the state level. Clonie learned to play poker from her boyfriend’s father. After she divorced from her first husband, she was living in Dallas and started going to Shreveport, Louisiana to play poker on weekends. She found that she was having a good deal of success and before long, she was doing well enough to quit her job at a travel agency. She had gotten to have some adventurous vacations through the agency, but she was ready to move on and work full-time as a poker pro. Apparently, the answer was that there was no reason at all not to enter. Gowen played in that tournament, her first major one. She not only played well, but she finished in 10th position. It only whetted her appetite for more. 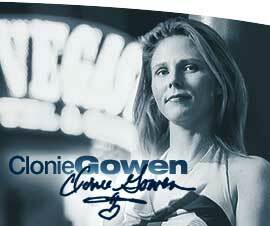 In 2003, Clonie Gowen was on hand for the Season 2 World Poker Tour Ladies’ Night. She played proficiently and came out on top. After winning this event, she was well on her way to poker stardom and due to her looks was a draw for the TV camera’s who were following the sport of poker more and more as it’s popularity grew. Other winning performances by Gowen include a 7th place in the $2,000 No Limit Hold ‘Em Ultimate Challenge tournament and 3rd place at the FullTiltPoker championship at The Wynn, Las Vegas. She also participated in the Poker After Dark TV series and won first place during Ladies’ Week for a purse of $120,000. Clonie Gowen has been a guest commentator for events such as the Ultimate Poker Challenge. She has been a regular commentator for Bluff Magazine at the World Series of Poker. She is also on the board of directors of the United States Poker Association. She has also hosted many tournaments and charity events and started a school to teach poker. Her theory is that players need to be well-trained to play poker with the concept that it is their money on the table. 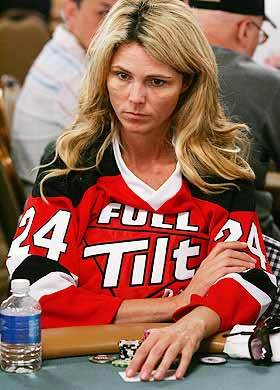 Clonie was an original member of Team Full Tilt but this ceased when she fell out with other former owners Chris Ferguson and Howard Lederer over a 1% ownership she claimed to have been promised in Full Tilt Poker, which ended up being thrown out at court, leaving Gowen with nothing. She is rarely seen playing poker nowadays and is rumoured to have moved to Australia with her new husband to start a new life. Although you will not find Clonie playing poker at Full Tilt Poker any more, you will still find the other famous professional players there where you can sit down and play with them or just watch and learn from the best.